One of the three peaks in the central parts of the Misty Mountains that were collectively known as the Mountains of Moria. Together with Barazinbar and Bundushathûr, these three mountains stood above the ancient underground Dwarf-city of Khazad-dûm, later known as Moria. Zirakzigil (sometimes abbreviated to simply Zirak) is the Dwarvish name for this mountain, meaning something like 'silver spike', referring to an extremely narrow and pointed summit. The name was formed into Elvish as Celebdil, and in Mannish tongues it was rendered as 'Silvertine'. 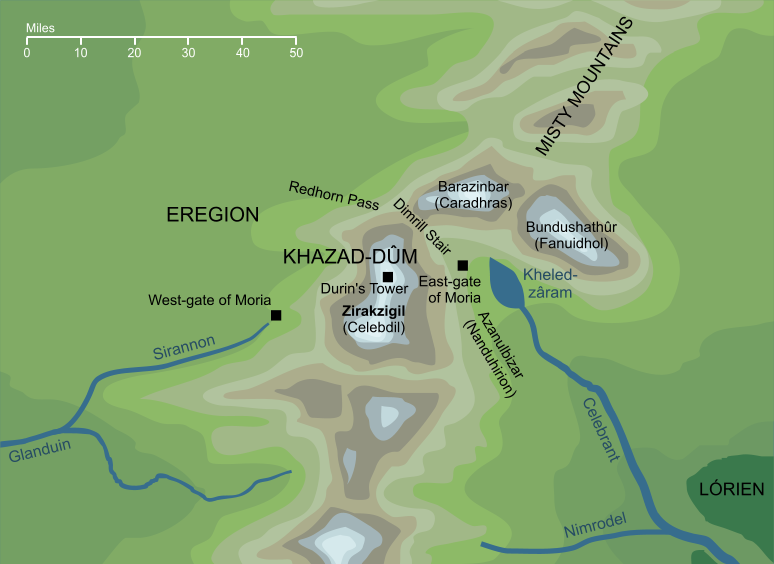 The three Mountains of Moria formed an approximate triangle among the Misty Mountains, with Zirakzigil forming that triangle's southwestern corner. Between it and the northern of the three Mountains, Barazinbar (also called Caradhras or the Redhorn) ran a steep and dangerous pass, one of the very few that led through the Misty Mountains from west to east. It was through this treacherous Redhorn Pass that the Company of the Ring made a failed attempt to cross the range, before resorting to a journey through the darkness of Moria. On the narrow peak of Zirakzigil was a single tower, Durin's Tower, reached by the Endless Stair that led up from the deepest depths below Moria through the rock of the mountain itself. It was at the summit of Zirakzigil that Gandalf fought a Balrog in the Battle of the Peak, a dreadful confrontation that shattered the ancient tower and broke the mountainside itself. In the first edition of The Lord of the Rings the name of this mountain is consistently hyphenated as 'Zirak-zigil'. For the second printing, Tolkien chose to amend this to an unhyphenated form, correcting the name throughout to 'Zirakzigil', except for two cases which he apparently overlooked. Later editions have been further corrected to use the unhyphenated form in all cases. Zigil is known to be the Dwarvish word for 'silver', but the meaning of zirak is uncertain. Mannish tine refers to a high point or peak; it is probably a fair assumption that the Khuzdul word has a similar meaning. Zirak does appear in one other place, as a title or surname of Gamil the teacher of Telchar, so it probably carries the more general meaning of 'high' or 'tall'. Original content © copyright Mark Fisher 1997-2000, 2015. All rights reserved. For conditions of reuse, see the Site FAQ.